I will start with a bit of background as paraphrased from the Tamiya information sheet that is included in the new Gama Goat kit. The Goat was designed to rectify a problem that French troops deployed in Southeast Asia had noted with US equipment. Vehicles that the French deployed were unable to handle the strain of operations in that region of the globe leading to a call for prototypes to test. The contract was awarded to Chance Vought, later LVT, for their six wheel, articulated, design which provided power to all wheels, had a small turning radius, and an 1 1/4 ton payload capacity. 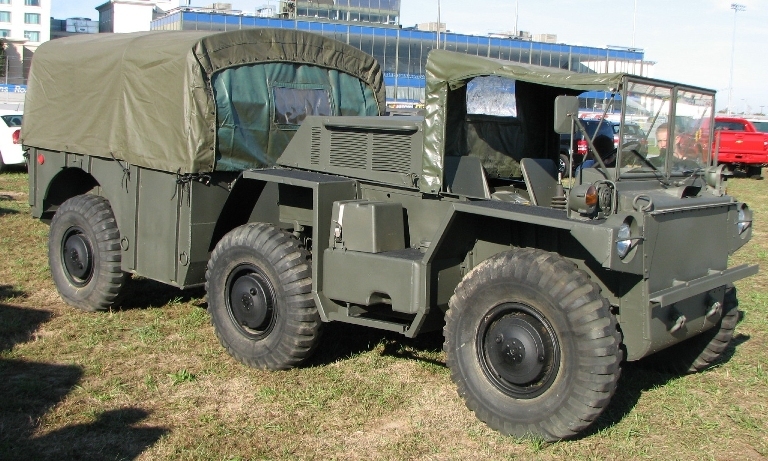 The vehicle was designated as the M561 and was nicknamed “Gama Goat” as a diminutive of chief designer of the articulation joint between the powered trailer and the tractor, Roger Gamaunt, and the fact that it could go anywhere in the same manner as a goat. When I opened the Tamiya box I was a bit taken aback, where was the huge parts count, the 20 or 30 different sprues, the plethora of ‘not for use’ parts? I had forgotten how well detailed and yet simple, the average Tamiya kit can be. The Goat certainly holds up that reputation well; the base plastic is provided on only two larger sprues and two smaller ones for the entire kit, certainly different from what I have been building over the past several years. Let’s dive in; the first thing I did was to give everything a nice shot of Vallejo Olive Drab primer to provide a good undercoat to everything that I would be doing. After that had been given sufficient time to dry it was 8:30 PM on Friday night, right about time to start cutting some plastic. The first five steps all concern the suspension of the tractor unit. Some of you may find this the most interesting part of the build, but for me it is always a bit of a slog. I much prefer to work up top in and around the business end of any particular model. If you are anything like me you will really like the way that Tamiya simplifies these necessary steps as much as possible; one piece suspension units or at least no more than two pieces. It helps move this part of the build at a much quicker pace and as a bonus it keeps everything nice and square. It takes all of seven parts for the entire front and rear suspension units for the tractor; I know, give that man some air, he looks a bit pale! All done with the first five steps, total time elapsed; 50 minutes. For me that is an incredibly quick build. You do have to sacrifice a few things along the way in order to get the underside built up that quickly. The parts are certainly more than just a little on the thick side. The suspension can’t really be articulated which may be a bit of a let-down considering that one of the unique features of this vehicle was its ability to pitch and roll which could only be shown with an articulated suspension. The number of knockout pin marks is also quite high, thus far they are for the most part well hidden but the jury is still out as to what I will encounter in the next few steps. As I worked on getting the tractor together a couple of thoughts became clear in my head; first, there is a reason that Tamiya has the reputation for easy to build kits, because it is a hands down fact. The fit and engineering of this kit thus far has been nothing short of perfect. No part needed additional sanding or jimmying around to achieve a decent fit, everything fits like a hand in a well worn glove. The instructions have been, well, instructive, which as we all know is not always the case. The other impression that I have formed is that ease of construction has been accomplished by omitting a lot of the detail. No driver’s gas or brake pedals, and while I like the simplified suspension, you are missing some of the underside fittings in particular. Also, some of the knockout pin marks are not quite hidden from view, close to being hidden but not quite. In the crew compartment of the tractor ejector pin marks behind both seats as well as at the feet of the driver and co-driver. Another area were the detail is a bit thin is the large engine cover behind the drivers tub; the cooling louvers are all molded solid, not a deal breaker but lots of modern kits now are molded with open louvers. Next up is the trailer and wow did this go quick. You get one really large assembly that encompasses the entire drive train, axle assembly, lower trailer, differential, everything! To say that it speeds up construction is a gross understatement; it will enable you to fly through the trailer. Besides the one large piece, five other pieces provide all that you will need and you are ready to get to the trailer’s sidewalls, the tailgate, and pioneer tools, plus a few smaller fittings. The tool setup is a bit lacking in detail, the shovel which sets on top of the tool bracket holder, will probably be the one tool that most modelers will add a bit to. The last part of the build is the attachment of the one piece sidewalls, front and rear which all attach solidly to the bed. The raise strakes on the trailer sidewalls have some hefty knockout pin marks, but a few minutes with a sanding stick took care of that issue. The detail here may be a bit simplified as it is through the rest of the kit, the bumper stops should be hollow but Tamiya provides them as a solid piece, latches for the tailgate are molded on, and no small bumper on the trailer rear. With the completion of the trailer I was a little past the 4 hour mark for the entire kit. Into the spares bin goes exactly ONE part, the full windscreen which I didn’t use opting for the folded version instead. Because I am easily led astray and the instructions called for it, I went out and bought a rattle can of Tamiya TS-28 Olive Drab 2 because it just might be a slightly different shade of OD that I can’t replicate with the 10 to 12 different olive drabs that I have in my paint box now. Surely, another shade of olive drab is a good thing isn’t it? Besides I felt like if I had the review kit the least I could do was paint it with the color they recommended. A couple of good shakes and I gave the finished model a good blast. After a couple of coats with the TS-28, yes it was a slightly different shade from anything in my repertoire of OD, I started with some of the detail painting. Tires, seats, headlights, tools, etc. Somewhere in the middle of all that detail painting I decided to get started on the decals. I had chosen the third of three marking options for a 1976 unknown unit; I’m guessing it must be a refugee from the 1944 fighting on the Eastern Front which so many model companies have immortalized as “unidentified unit”; perhaps the largest formation the German’s fielded during the war! This particular unit, whoever you are, has a simple one color scheme, the aforementioned TS-28 Olive Drab. The other choices are a Marine unit, also in OD, and an 82nd Airborne vehicle from the Grenada operation that sports the 4 color camouflage. I had thought about giving that a try but I had promised Jim that I would have this review done before the weekend was over and I knew that I wouldn’t come close if I tried to handle that scheme. Back to the decals; I thought they felt a bit thick but they all handled easily. They were not overly thick when off the backing paper and they all were strong enough to absorb a bit of handling without falling apart or ripping. There are quite a few, almost felt like one of those wingy things with the number of decals used. It took me about an hour to get all the decals on the model. The detail painting took about an hour all told, so between that and the decals it was about two extra hours to finish it off. I didn’t really spend any time to speak of with the base coat of TS-28 OD, a couple of three light coats misted on did the trick and left a bit of the primer coat up in the recesses and crannies to provide a bit of depth to the whole thing. I finished it off with a light coat of Vallejo satin varnish to more closely match US Army stateside vehicles in the 70’s. That just about does it, the only thing left are a few reflections. One, it is an incredibly enjoyable kit to build, no frustrations with anything at all. Everything fit better than could be expected, most parts holding on themselves even before I added a spot of glue. Two, it was an extremely quick and easy build, six and one half hours tops. Three, a lot of the detail has been simplified or omitted, really more of a kit aimed at the intermediate market, not the rivet counter (not that there is anything wrong with that!) level of modeler. Four, expect some photo-etch from aftermarket suppliers real soon as this kit could use a few upgrades to make it really shine. Finally, the price of the kit I have seen listed as anywhere from $47 to $21.03, at the lower price it is a steal, at the higher, well that may be a bit high for what really amounts to a nice weekend type kit. I would highly recommend you pick up one of these, particularly if you can get a nice price. It is a unique vehicle, it goes together like a dream, and if you pushed you could crank out two of them in just one weekend! Highs: Brand new subject that has not been kitted before. Ease of construction and near perfection on the fit of every part. Lows: Detail simplified or omitted in several areas in order to simplify the build. Verdict: Outstanding kit, a great build for a long weekend. Highly recommended. Hi, All! Great review, THANKS! I can already envision this vehicle in several different camo schemes! This is a very interesting new subject which I think will be finding it's way into a lot of modellers' collections. As to the simplicity of this kit, it's kind of refreshing to see that clever engineering keeps the parts-count low. But there are always two sides to that coin. I'd have liked to see a little bit more sophistication in the crew area, especially the gear shift levers and pedals. I think that the tires could have been molded to simulate a slightly "sagged" or flattened appearance as well. But not quite as over-done like the DRAGON US WWII Half-Track-series' tires that caused such an uproar when those kits first came out. I can remember the A/M companies falling all over themselves in rushing perfectly round "correction" tire sets to market, only to be proved wrong. Even when tires are inflated to maximum air pressure, they will still be very slightly flattened at the point of road/land-surface contact. I know this to be a fact. 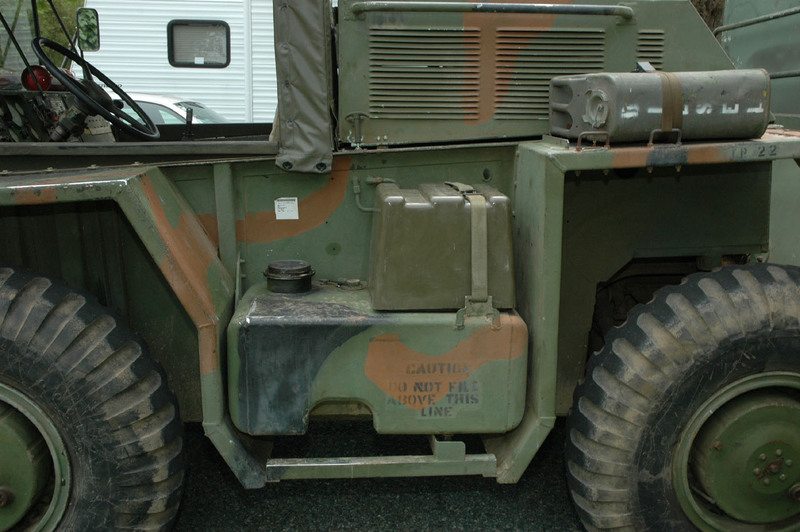 When I was gawking at and photographing REAL US Half-Tracks and other wheeled vehicles at WWII re-enactments, I asked the various owners of these vehicles about "tire-sag". To a man, I was informed that their tires were inflated to maximum pressure. There's nothing like inspecting the real thing to settle any arguments over inaccuracies, real or imagined, in any given model kit... No doubt we'll be seeing the various A/M companies offering resin and PE updates and "correction" kits HOORAY FOR US!!! Looks good! Quite the surprise to see this article, as I had not known this was on the horizon! I built the PSM Goat early last year, along with the GOER, and was quite content thinking this was the only kit we would see of the M561. Now, maybe a few AM additions for the small things? I'll still build one OOB for competition with the MERDC desert scheme I got to know oh-so-well back in the mid-70s. Noisy things, first time I saw mandatory hearing protection requirements, and after the first time crewing one, I realized "why"! Good review, Rick. Unfortunately, for me, I enjoy the suspension the most on soft afvs. I can handle the ejector pin marks, but simplified and omitted details are a deal killer. Don't get me wrong, I have no problem scratch building some of the details. The final drawback is build time. I enjoy building and painting equally. Six hours just doesn't strike me as much fun. But, I'm coming up with more cons than pros. I'm sure a great kit, none-the-less and it will fill a gap in OD vehicles. Just got one for the museum from Tamiya today. It's an early shot, but looks like it's gonna be a fun little build. I'm probably going to scratchbuild a FAAR radar for it too. I'll post pics as soon as I'm done with the York.